Even though he is pushing 76, Msgr. Harold Knueven is hard to keep up with. At a time when many people have long since started relaxing in life’s golden years, Msgr. Knueven is leading a multimillion dollar project to move the entire campus of St. Mary Parish in Greensburg, where he has served as administrator since 2003. “Everybody compares him to the Energizer bunny because he just keeps going,” said Donna Lecher, the outgoing president of St. Mary Parish’s parish council. Ordained 50 years ago on May 3, 1958, Msgr. Knueven has kept himself on the go for the last half century by making sure he takes care of himself physically and spiritually. Msgr. 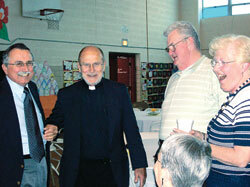 Mark Svarczkopf, pastor of Our Lady of the Greenwood Parish in Greenwood, once shared a room with Msgr. Knueven when both were on retreat at Saint Meinrad Archabbey in St. Meinrad. Msgr. Knueven grew up in the 1930s and 1940s deep in southeastern Indiana, across the street from St. Paul Church in New Alsace, his home parish. For many years, the parish priests had encouraged the young Harold Knueven to consider the priesthood. When it came time for him to enter high school, he decided to become a seminarian and study at Saint Meinrad Seminary in St. Meinrad. “My mom and dad took me [there] in the fall of 1946,” he said. “I saw them drive over the hill and I thought to myself, ‘What am I getting into?’ I didn’t know a soul at Saint Meinrad. I was a freshman in high school. Seminary life agreed with him enough that, once ordained, he eventually served from 1962-75 on the staff of the former Bishop Bruté Latin School in Indianapolis, at the time, the archdiocese’s high school seminary. Through his ministry there, he helped shape many priests in the archdiocese younger than him. “It’s always good to know that you’d touched the lives of these young priests that are still active in the parishes,” said Msgr. Knueven. One of them is Msgr. Svarczkopf, who has immediately followed Msgr. Knueven in four pastoral assignments, including his current one as pastor of Our Lady of the Greenwood Parish. Although a physically active priest, Msgr. Knueven looks to his life of faith as the source of his vitality. Msgr. Knueven said he prays the Liturgy of the Hours every day before the Blessed Sacrament in St. Mary Parish’s perpetual adoration chapel, which he helped establish. He also helped start one at Our Lady of the Greenwood Parish. According to Lecher, Msgr. Knueven’s deep life of prayer is the force behind his ability to lead a parish through large projects. Msgr. Knueven is trying to do this now at St. Mary Parish. He did it at Our Lady of the Greenwood Parish in the 1990s when he helped that Indianapolis South Deanery parish build a new church. And in the 1980s, he helped St. Simon the Apostle Parish in Indianapolis retire an $800,000 debt. In the parishes where he has served, people have trusted Msgr. Knueven and turned to him for help at any time. For Msgr. Knueven, that availability to those whom he serves is at the heart of the priesthood that he has lived for 50 years.